The first official test of the 2011 MotoGP season got underway on 1st February, 2011 at the Sepang circuit in Malaysia. Yamaha Factory Racing Team riders Jorge Lorenzo and Ben Spies were quick to get up to a good pace on track, both riding under last year's race times before the end of their first session despite not having ridden a motorcycle for two months over the winter break. With many parts and electronics to test over the three days, today's objective of familiarising themselves with their YZR-M1's again was a success. Reigning World Champion Lorenzo wrapped up his first session as the second fastest rider of the day, just four tenths from the top. Team mate Spies was just less than four tenths behind him in fifth. Day two will see both riders working on various areas of the 2011 race bike's development along with testing tyres for MotoGP tyre supplier Bridgestone. In advance of the official 2011 Yamaha Factory Racing Team launch at the second Sepang test, both riders took to the track today riding YZR-M1s with plain black carbon fibre fairing. From the next day however the M1 of both Lorenzo and Spies will have a special "one-event" Yamaha Factory Racing Blue de-branded design. This design will only be used for the remaining two days of the Sepang test. On the final day of the test, both riders will continue to test developments of the 2011 M1 along with new Bridgestone tyres to provide some data for the MotoGP championships sole tyre supplier. Today saw the final session of the first official MotoGP test of 2011 at the Sepang circuit in Malaysia. 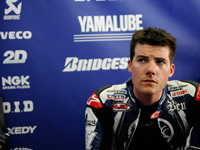 Yamaha Factory Racing Team riders Jorge Lorenzo and Ben Spies spent the three days on track evaluating a number of development steps for the 2011 YZR-M1 ahead of the new race season which kicks off next month. Lorenzo's session focused on a series of shorter runs as he continued evaluating the various developments, impressing his team as he maintained a faster pace through the afternoon despite the increased track temperatures. The reigning World Champion finished the day in third position, just 0.088 seconds off the top of the time sheets. New factory rider Spies was again among the fastest riders on track for the majority of the day whilst working through various electronic settings on his bike. This test also marks the first time the Texan rider's complete crew have worked together. "Jorge feels quite comfortable on the bike. He's got more patience this year and has taken a very considered approach to the test. I'm happy that we've completed a successful test with both riders on good form having blown off their cobwebs. We have enough data to decide which direction we have to go in now for our next visit here which was our first priority. We've seen it's very competitive over the last couple of days with more riders than last year able to compete for the podium so I think it's going to be a very exciting season." 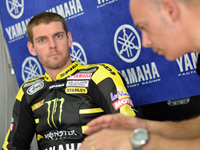 "A good final day for Ben today, again he was straight up to a good pace which he was consistent with over the session. This was the first opportunity for all of Ben's crew to work together, I am very satisfied to see there were no problems and they fit together well. Overall as a team we are pleased with this Sepang test, everyone has worked hard to ensure that on both sides of the garage we have tested everything we needed to. We can now go away and prepare for our next session here later in the month where we are confident we will make another step forward in our development for the 2011 bike to be ready for the start of the season." "It was good to get back to work with the Monster Yamaha Tech 3 Team and I am really happy with the development that Yamaha has done on the bike for 2011. It has improved in every area and it was great to get back up to speed so quickly and post consistent and competitive lap times on each day. The engine is a big improvement in terms of power and the chassis helps me turn much better than I could before, so in all aspects I am happy and confident that I can have a strong season. Looking at the field there is some unbelievable talent but I feel really motivated to repeat some of the strong results I had in 2009. It is not going to be an easy task but I am sure with the help of the Monster Yamaha Tech 3 Team it is not unrealistic to fight for the top six. I'm looking forward to being back on the back again later this month so we can fine-tune the package ahead of the first race." "I am happy with the test because I am still learning so much but I was able to run a consistent pace and drop my lap times on each day. I'm on a big learning curve and I wasn't looking for pure speed. I'd never ridden at this track before and it is certainly a tough place to learn quickly. All the other guys have done millions of laps around here and I just need to build up my experience. I've got to improve in every area but I'm happy and the Monster Yamaha Tech 3 Team are happy too. My times are in the ballpark of those set in last year's race and that's pleasing considering everything is still so new for me and I wasn't in peak physical condition because of my shoulder. I need to improve in the braking area and also step up my pace on the hard Bridgestone tyre, but I feel I'm getting more comfortable with the bike. I've been looking at loads of data and when we return later this month I'll continue trying to adapt my style. I'm still riding the bike too much like a superbike, but I'm pleased that I'm progressing and getting faster."